Fair to say that I was a busy little bee in the kitchen for most of the long weekend baking up an absolute storm! and a yummy storm at that. Yep – you guessed it, I am the number one culprit of ‘tasting’ whilst you cook and adding ‘one date for the blender and one for my mouth’ … “pickers wear big knickers” as my mum used to say but what’s a good cook who doesn’t taste their food right?? Ok yes I agree having spoonful after spoonful straight from the peanut butter jar and nibbling on dates isnt quite taste testing the mixture but it tastes good!! 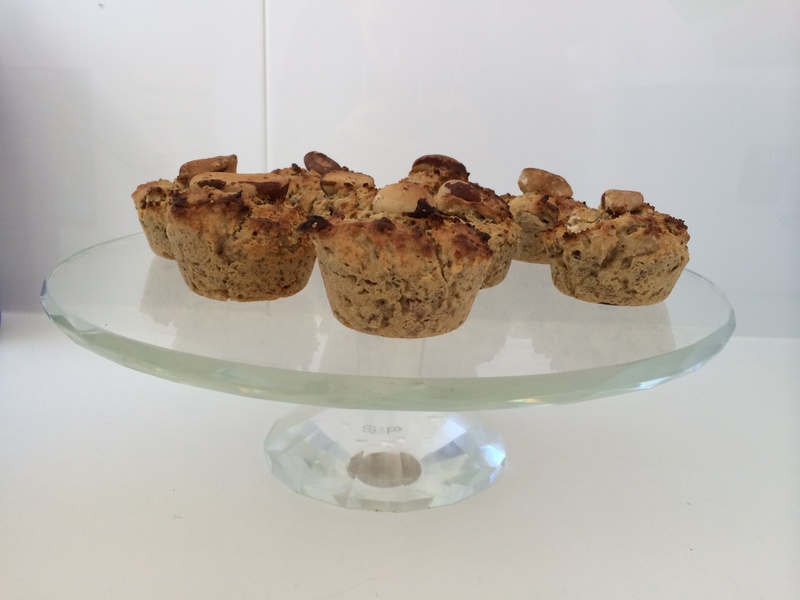 Muffins are one of my favourites and absolute MUST HAVES in the freezer. Not only are they a great sized high protein, high fibre and low carb/sugar snack but they are great for quickly grabbing something on your way out the door rather than reaching for chocolate, lollies or chips. Ever racing out the door without breakfast? Fading away at your desk with a boring apple for morning tea? Nothing but processed LCM bars to put in the kids lunch boxes? Inhaling a whole block of chocolate when you get home from work (we have all been there)? or having a drumstick ice cream for dessert because you can’t find a healthy substitute? If you answered yes to any of these then you have got to get baking!! Some of my favourite muffin flavours are banana date, apple cinnamon, raspberry white chocolate and traditional blueberry. You can really add anything you like and mix it up often so you never get bored. I like to eat them straight from the freezer because not only are they super dense and hard but it also means I have to breath between mouthfuls and eat slower. Alternatively heating it up for 30 seconds in the microwave and spreading some fresh butter, mashed banana or nut butter on each half is just as divine! Just don’t forget a little cinnamon sprinkle too! 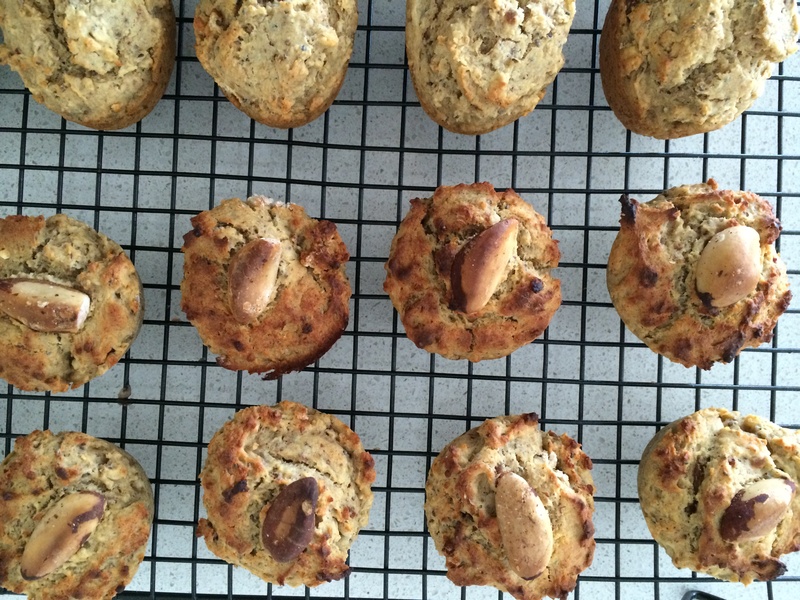 So back to my baking weekend – after looking over at the fruit bowl and seeing some rather brown spotty sad-looking bananas I thought it would be the perfect opportunity to get muffin making. We had just spent some time out at my partner’s mums property and was lucky enough to bring home 18 freshly laid farm eggs – so BOOM … apron and oven on! This particular recipe uses a food processor although I am sure with some serious elbow grease and a more ‘chunky’ outcome you could do without. Bananas are a fantastic source of potassium and good carbohydrates for energy. 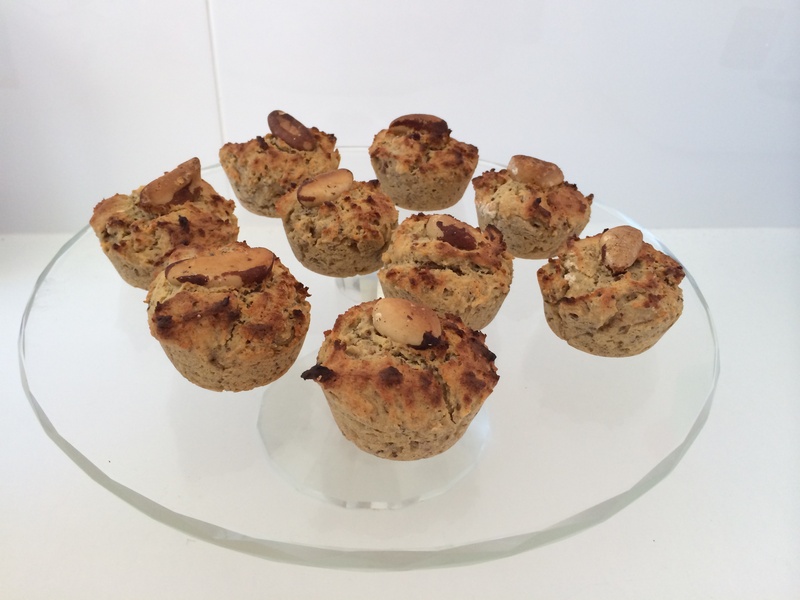 Combined with the added fibre and essential nutrients from the dates and the omega 3 and protein content of the chia seeds these power house muffins will keep you feeling full for longer and avoid any 3pm sugar crash. 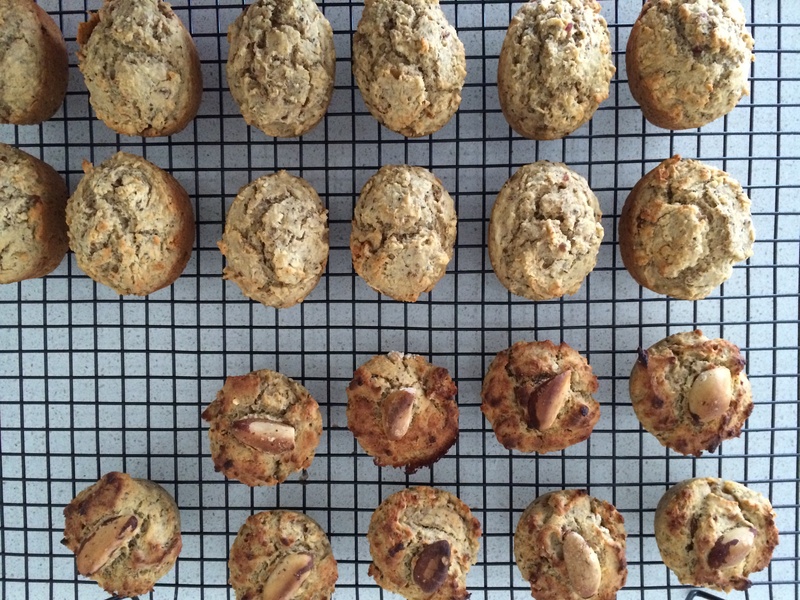 Pre heat the oven to 160 degrees and line a 12 cup muffin tin with patty pans or oil. You might need 2 trays depending on the depth/size. I used a friand tin and a silicone muffin tin so what ever is going is good! Place the bananas, dates, eggs, vanilla, coconut oil and juice/water in the food processor and blend until smooth (about 2-3 minutes). In a large mixing bowl combine the all dry ingredients except the walnuts. Make a well in the centre of the mixture and pour the banana mixture from the food processor slowly into the bowl. Carefully fold the walnuts in and stir until combined. If you want a more ‘chunky’ texture you can add a few roughly chopped dates into the mixture now. Once combined spoon the mixture evenly into the patty pans about 3/4 full. Place in oven for 15/20 mins or until the skewer comes out clean. 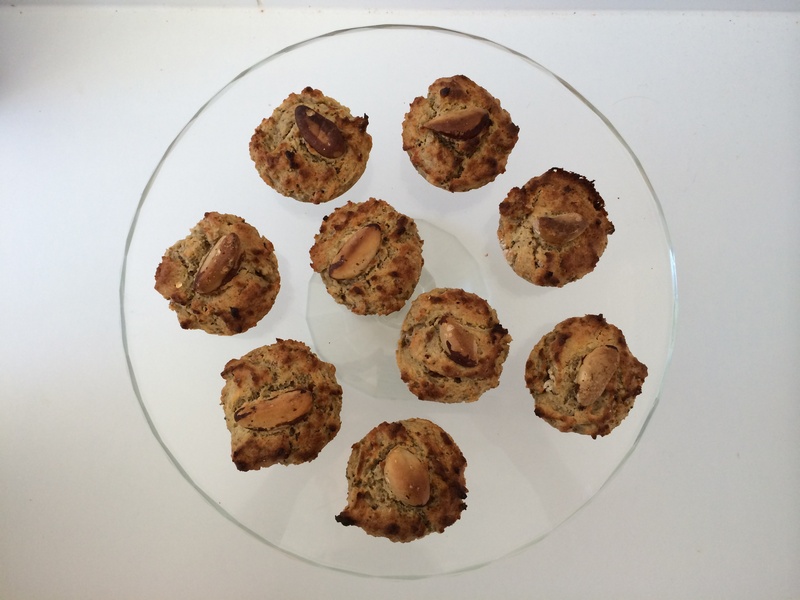 Note: I topped some of the muffins with a large brazil nut (for my other half). Brazil nuts are rich in selenium which is great for protection against heart disease and prostate/breast cancers. 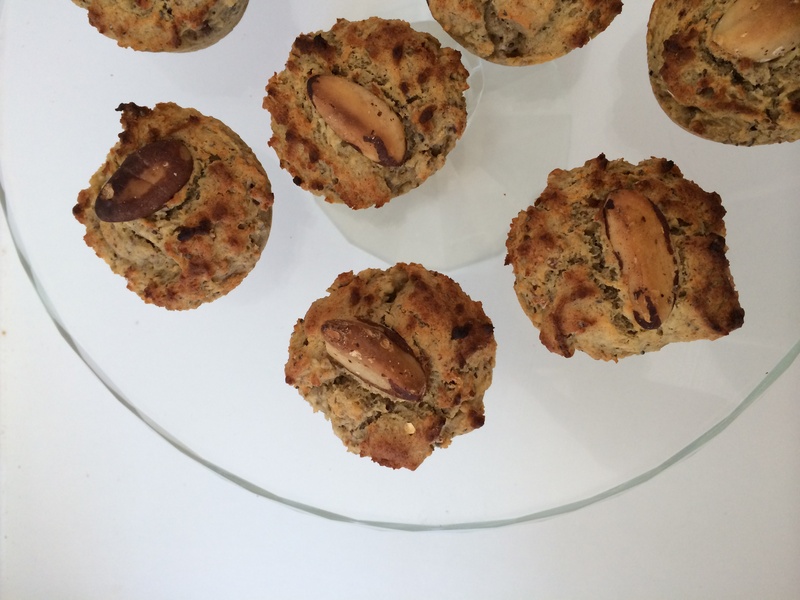 They also have high antioxidant enzymes that boosts the immune system and it makes the muffins look super cute!